Nathan at TDA Training has a lot of good info on boxing, including articles on boxing for self-defense, boxing combinations, and such… One of his more popular articles describes 3 C’s of boxing defense and 3 C’s of boxing offense – good rules of thumb that make things a lot better better during sparring. In this article, Nathan says that for defense, you should Circle, Cover, and Counter and that for offense, you should Close, Cover, and Clear. Read his article for details. The line between offense and defense is blurry at best most times, so, what if we combined the two groups into one? Cover appears twice. Maybe it is twice as important, but what if we replaced one Cover with a Clinch. Cover – Keep your hands up between you and the opponent. Try to keep your hands on the plane between your centerline and his. Controlling the center of the conflict is extremely valuable. Circle – Get slippery. Evade, avoid, brush-off, refuse to engage, disengage. Clear – get out of there! Wow! All of a sudden Nathan’s boxing strategy is the same as our aikido self-defense strategy. Cool. Whoda thunk that boxing and aikido have that much in common? Subscribe to Mokuren Dojo in a reader or via email. Who won the match in the picture, and how? I don't know. 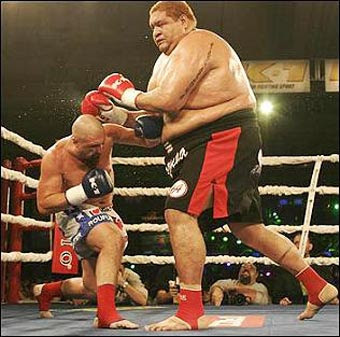 I tried to look it up and found some articles and videos of some monsterous Russian boxing Giant - but not this particular one. Isn't that Nikolay Valuyev (the Russian Giant you found)? No education for me, thank you.